We talked previously about how to grow an email list. You’ll notice one thing missing from that list though – you can purchase an email list. Many companies have them for sale, for a variety of niches. However I do strongly advocate against purchasing an email list, for a number of reasons. How Was The List Acquired? This should be the first question on how this list came to be, in that how was the list acquired? Often it’s from those boxes on contact forms that say “Untick here for offers and promotions from special partners” (or words to that effect), this is where a lot of these email addresses come from, and is probably the least legally dubious method. The problem with this method is unfortunately these email addresses are completely irrelevant to your niche. Particularly if you exist in a small, defined niche, often these email addresses are rather too general, and certainly unlikely to be interested in your products. Sorry. How Is The List Sold? Here’s the thing, even if the list is incredibly targeted and right for you, the chances are that you won’t be the only person that the list is sold to. If you are the millionth person emailed cold, then they will be quick to mark you as spam. This will harm your list going forward, as you don’t want to be associated as a spammer. How To Deal With a Paid List? 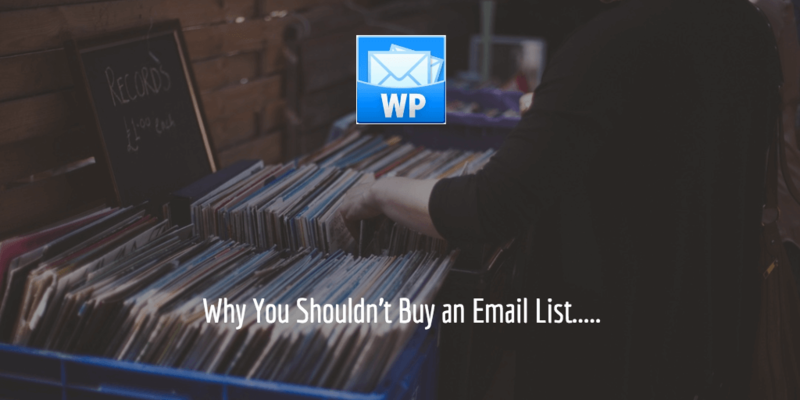 If you are to buy a list (which is something we don’t recommend) then maybe a better solution may be to prune said list to get people warmed up and receptive to your emails. Even if they don’t convert, it would be less damaging. A good way to do this is to approach them via a free e-course using something like Drip to manage their interactions, that way you can remove the dead weight quickly. But that is just paid subscribers. How about the rest of you? Do you agree with me that paid lists are terrible, or have you found success with them? Leave your thoughts in the comments below!